Screencasting is a simple task anyone can do it with ease. All that you need to do is download a software program, press the record button and soon all movements on your device screen video will be recorded. Crazy video gamers do the same thing to share their interesting game videos on YouTube channels. There is a wide range of software tools that can assists you with screencasting needs. Even YouTube itself has the ability to capture device screen without the need for the additional software tool. If you are interested to know how it can be done, simply go through the details below. Step 1: Open YouTube on your computer and sign by using your Google Account. On the top left corner, you will find Upload button, press it and go to live streaming section and choose events from the drop-down menu. When you are doing this for the very first time, YouTube will ask your phone number to verify the streaming process. You can also click here to get to the Livestreaming page directly. Step 2: On the create an event page, add a title for your screencast video; set privacy terms and then hit “Go Live Now” option. 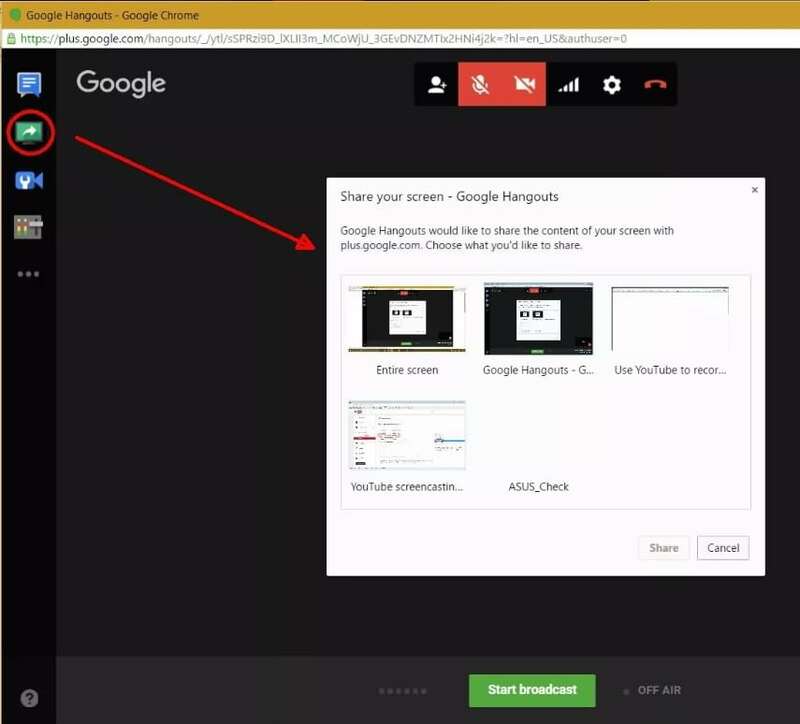 Step 3: The Hangout on Air page will get opened. It will allow you to select-deselect webcam recording as well as mic recording. Step 4: Hit the screen share button from the left toolbox and choose the desktop window that you wish to record. Now press start Broadcast button to start screen recording. Note that it is a private session that cannot be watched by anyone else. 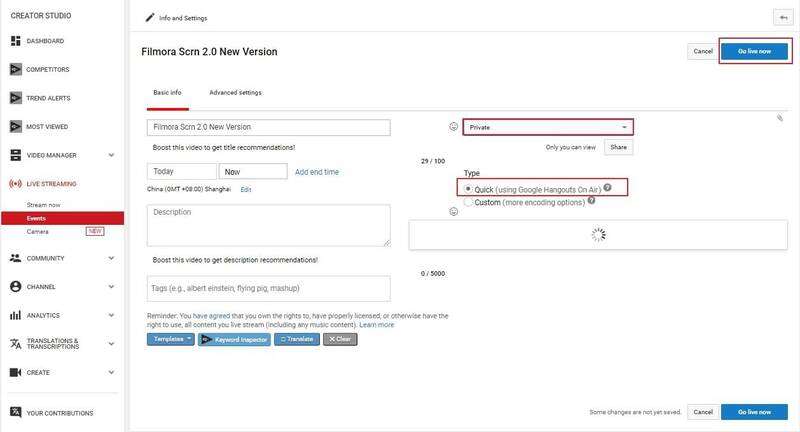 Step 5: When your video is ready to go to YouTube video dashboard and choose your recent screencast video. Download it to Google Drive and share with the world. Those who are interested in capturing screencast with high-quality videos and need an easy to use built-in editor to customize these videos; it is good to look for some dedicated screencast tools. Experts recommend using Wondershare Filmora scrn due to its advanced features and interactive software platform. Filmora Scrn is one of the most interactive software tools that works perfectly on Windows and Mac platform. It supports more than 50 media file formats. Filmora Scrn allows users to record with Webcam and PC simultaneously. It is possible to record audio from mic input and internal computer audio as well. With Filmora Scrn users can record high paced videos at 120fps. Add markers to important frames during recording. There are so many benefits of using Filmora Scrn for YouTube screencast video recordings. The biggest trouble with YouTube based recording is that when you try it for the very first time, YouTube will take 24 hours to verify your account for the live streaming. But by using Filmora Scrn, you can do this task instantly at any hour of the day. Another great news is that Fillmore Scrn comes with a built-in video editor that allows users to customize videos with ease. Once your videos are ready, you can share them directly to social media platforms including YouTube, Facebook, Twitch, and Vimeo etc. Let's watch the video below to check how to record your screen with Filmora Scrn and upload the recorded video to YouTube. With all impressive features, there is no doubt to say that Filmora Scrn can serve your screencasting needs in the best possible manner. Whether you are a crazy gamer interested to share your adventure videos with the world or want to create useful tutorials for your audience, Filmora Scrn is your best companion for all your needs.